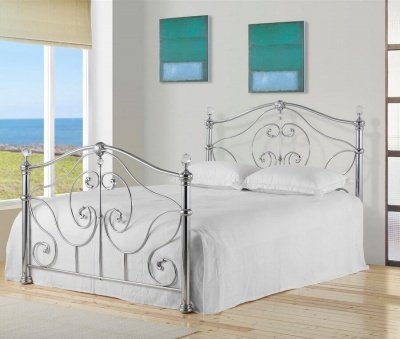 Black nickel or chrome finish Georgian style square metal bed frame with a modern twist. Ornate detailing on the head and foot board has been replaced with a square design. Giving the Edward bed frame a strong presence. Large round finials, detailing to the foot posts and feet add to the allure of this bed frame. Robust build with a self supporting frame leaving no need for a central support. Enabling you to maximise the use of storage space underneath the bed if required. Under-bed clearance space is 30 cm.